Uhhh, yes. Several times, in fact. 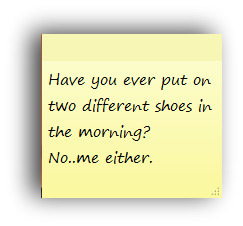 Once I wore two different black shoes to work. Doesn't sound bad, but one was plain and the other was textured. And I wore one black shoe and one white shoe to church. Didn't even notice till my daughter said something as we walked into the building. Luckily, my outfit was also black and white--so I just acted like it was on purpose! Yes I did!! I have a pair of boots that are the same. One in black and the other in brown...it was very early in the morning and I was rushing around...put one black boot on and then the other foot had the brown boot...didn't notice until halfway thru my work day!! Very embarrassed! P.S. I sure like your new look. Yes, one black, one brown. Walked kids and kid art into classroom. Went to work. Back to school, where I helped out with Girl Scouts, then took girls home. All in one black shoe, one brown shoe.